When was the first legal claim made over the Babri Masjid? The first suit in the matter was filed on January 19, 1885. The Faizabad sub-judge who came to this decision was Pandit Hari Kishan, a Brahmin. Das then appealed to Faizabad’s district judge, Colonel J E A Chambier, who, after a spot inspection on March 17, 1886, dismissed the appeal on the same grounds. The Englishman also struck down the part of the sub-judge’s verdict which conceded the property to Das. When did the issue flare up again? The District Gazetteer of 1905 confirmed that both Hindus and Muslims were offering prayers in the same building until 1855. Nothing significant was reported over the next 48 years until 1934, when a communal flare-up over the slaughter of a cow in a neighbouring village provoked an attack on the Babri Masjid. Why was the idol not removed thereafter? No one dared to move it, despite a directive to do so from then prime minister Jawaharlal Nehru to then Uttar Pradesh chief minister Gobind Ballabh Pant. Then district magistrate K K K Nayyar expressed his inability to get the idol removed; he said he would prefer to be relieved of the charge rather than carry out the orders. How did the Muslim community respond? The ownership of the land, though, remained disputed as another local Hindu congregation, the Nirmohi Akhara, also staked its claim over it. The following year, five Muslims from Ayodhya led by Mohammad Hashim moved a petition before the high court, seeking a vacation of the injunction. In 1955, a division bench of the Allahabad high court ruled that the status quo needed to be maintained, but expressed the need for a final decision to be taken within six months, ‘in view of the seriousness of the matter.’ But nothing happened. Six years later, in 1961, Mohammad Hashim filed another suit pleading for restoration of the property to the Muslims. By 1964, the peripheral cases were settled and a date was fixed for the final hearing of this case. To this end, a new receiver was appointed in 1968. However, his role became redundant as yet another appeal was filed before the Allahabad high court in 1971. When did the Vishwa Hindu Parishad come in to the picture? The 1971 case was not taken up until 1983, when the VHP launched its temple movement in a big way. Even as the tempo of the temple movement increased, then Faizabad district judge K M Pandey ordered the gates of the disputed site to be unlocked late in the afternoon of February 1, 1986. This was done on an application moved by local lawyer U C Pandey, who sought permission to offer prayers. Simultaneously, VHP leaders S N Katju, Deoki Nandan Agarwal, both of whom were former Allahabad high court judges, and Shirish Chandra Dikshit, former UP director general of police, met the district magistrate, seeking permission for Lord Ram’s darshan. He also added that the ‘heavens will not fall if the locks of the gates are removed.’ But that did not hold true; the order sparked off communal clashes. Following this, the Sunni Waqf Board and the Babri Masjid Action Committee moved the Allahabad high court against the district judge’s order. The shilanyas in 1989 further aggravated the issue. The police firing ordered by then Uttar Pradesh chief minister Mulayam Singh Yadav’s government on the kar sevaks in 1990 polarised Hindu votes in favour of the Bharatiya Janata Party and brought Kalyan Singh to power in 1991. Kalyan Singh ordered the acquisition of 2.75 acres of land around the mosque in a bid to show his party’s seriousness towards building the temple. Babri Masjid Action Committee convener Zafaryab Jilani filed yet another writ petition to prevent any kind of construction on the acquired land. Meanwhile, Delhi-based Aslam Bhure moved the Supreme Court against the acquisition of land. But the apex court transferred the case to the Lucknow bench, with the directive that the status quo be maintained until the high court decided on the five writs that were, by then, pending there. 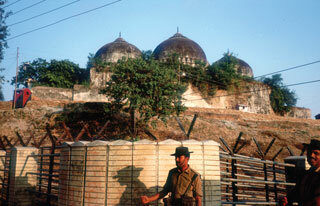 When was the Babri Masjid brought down? All hell broke loose on December 6, 1992 in Ayodhya, with violent Hindu mobs storming the 16th century mosque built by the first Mughal emperor Babur’s army commander Mir Baqi. Even as security personnel stood by that fateful day. the mosque was torn down by kar sevaks even as the top BJP leadership — including L K Advani — watched. Advani later expressed sorrow at the demolition — but it was clear to all that the forces unleashed by his rath yatra in favour of the temple in 1990 would be satisfied with nothing else. Who were the leaders charge-sheeted in the Babri Masjid demolition case? Among those charge-sheeted were leaders from the BJP, VHP, Shiv Sena and Bajrang Dal. Prominent among them were L K Advani, Dr Murli Manohar Joshi, Uma Bharti and Shiv Sena leader Bal Thackeray. The commission was set up 10 days after the demolition and took 17 years and 48 extensions before it submitted the report on June 30, 2009. The Commission blamed the entire temple construction movement on the Sangh Parivar. A former high court judge, Justice Liberhan called former prime minister Atal Bihari Vajpayee, Advani and Dr Joshi ‘pseudo-moderates’ and condemned them for their role in the demolition. ‘It stands established beyond doubt that the events of the day were neither spontaneous nor unplanned nor an unforeseen overflowing of the people’s emotion, nor the result of a foreign conspiracy as some overly imaginative people have tried to suggest,’ the 1,029-page report saiid.